Sacramento, CA - Jeep enthusiasts have been waiting for this moment for a long time. The name Gladiator first appeared in the Jeep catalog between 1962 and 1971; after that, the last Jeep pickup to roam our streets and trails was the Comanche, sold between 1985 and 1992. Since then, nothing. 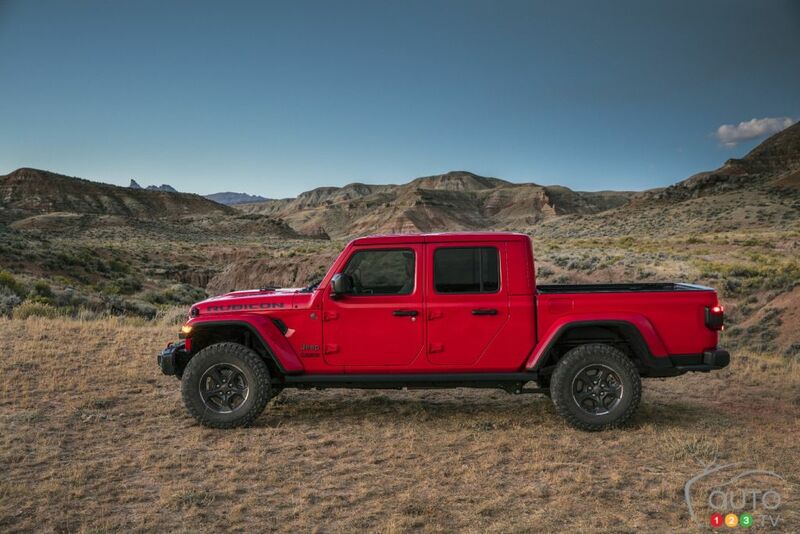 Now for 2020, Jeep brings in a new Gladiator. Jeep has big ambitions for this midsize model that will fight the good fight versus the Toyota Tacoma, Chevrolet Colorado and Ford Ranger. It will be available in more than 160 markets around the world, including Europe and Australia. Most of the people who approached me in the last year about the upcoming pickup from Jeep have had the same view: The Gladiator is a Wrangler Unlimited with a 5 foot box. No it’s not. There are a few things in common between the two vehicles. The front part right up to the A pillar is quite similar to the Wrangler except for the wider front grille to let more air into the engine. The configuration of the front suspension is also the same and the four doors are the same size as the Wrangler Unlimited. But the platform itself is not taken from the Wrangler, and the chassis was designed for the Gladiator specifically. The wheelbase is 19 inches longer and the overall length is 30 inches longer (or almost 3 feet). At the rear you have a five-link suspension configuration that draws heavily from the new RAM 1500, which offers a much more comfortable ride than the Wrangler. Taken ote that the Gladiator is available as a 4-door model only with the five-foot box. 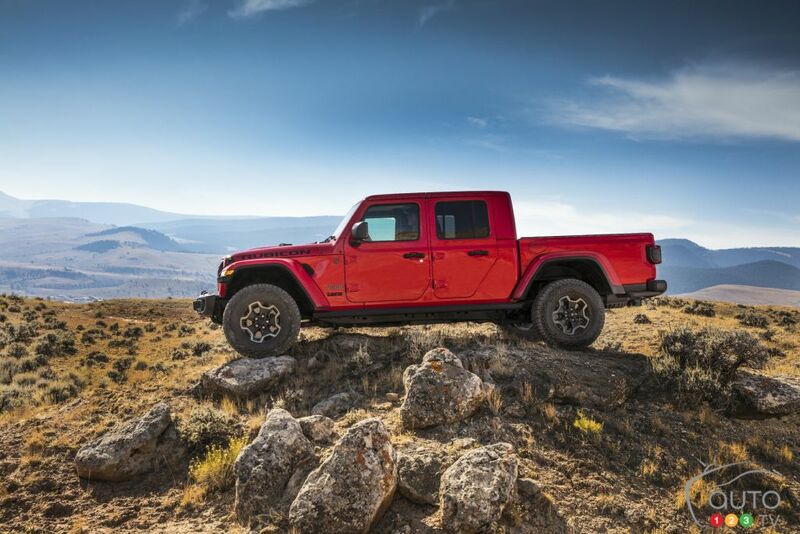 When it hits the market in May, the Gladiator will be available in three versions. The base Sport model is listed at $44,595 followed by the Overland model, which according to Jeep will be the most popular at $49,595, and the Rubicon at $52,595. These prices are for models with 6-speed manual transmission. You’ll get dinged for another $1,595 for an 8-speed automatic transmission. Jeep fans will find themselves at home inside. Like with the Wrangler, it’s possible to transform your Gladiator into a convertible. The model comes with two roofs (soft and hard) for about $3,000 more. You can also dismantle the doors and lower the windshield for open-air driving. Then there’s the excellent Uconnect system with a 7-inch or 8.4-inch screen for the Overland and Rubicon models. Apple CarPlay and Android Auto are offered with a built-in Wi-Fi hotspot in the Rubicon model. The Wrangler Navigation system also offers the exact longitude, latitude and altitude to orient yourself in off-road mode. The measuring instruments can display pitch and roll data, as well as information on the steering angle. There’s also a forward-facing camera that’s very useful in off-road driving to see obstacles in front and below like big rocks and such to help the driver position the front wheels. All Gladiators are offered with the 3.6L Pentastar V6 that delivers 285 hp and 260 lb-ft of torque. As mentioned the 6-speed manual gearbox is standard and the 8-speed automatic is optional. At some point in 2020 (Jeep didn’t get more specific than that), a 3.0L 6-cylinder turbodiesel will join the family. It will offer 260 hp and 442 lb-ft of torque. There will be no 4-cylinder turbo in the Gladiator. Our road test was in two stages. Our on-road drive started in Sacramento and involved both city and highway driving, until we arrived at a ranch where Jeep had prepared an off-road course worthy of the brand's reputation. On the on-road portion, the Gladiator’s longer body provided better handling and stability. 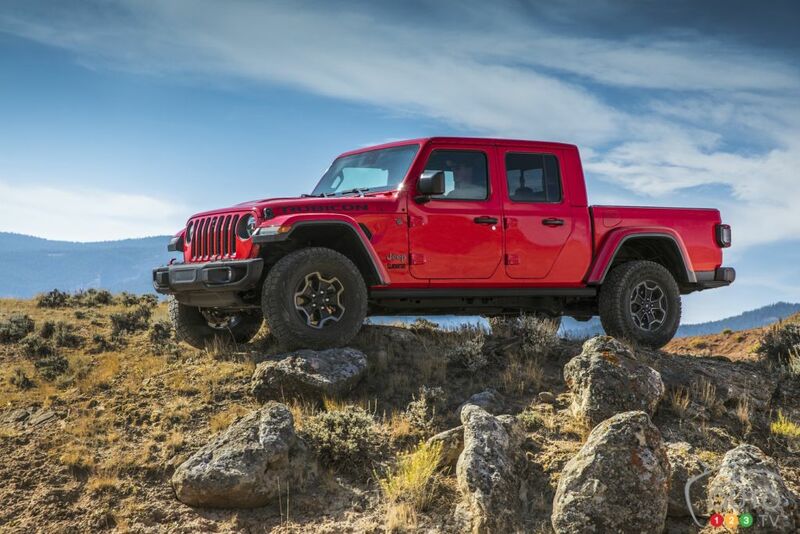 The comfort level is also far superior to what the Wrangler can offer, in good part because of the multi-link configuration of that rear suspension borrowed from the RAM 1500. The front suspension that comes from the Wrangler hops a little more and when you pass the 100 km/h mark you start to get hissing noises emanating from the roof panels. This gets more pronounced when you drive with the soft top on. In general, though, it's probably the first Jeep we could ride every day without having to make a monthly appointment with the chiropractor. Also present are drive-assist systems like Blind Spot Monitoring and Adaptive Cruise Control, plus a start-stop function that can reduce fuel consumption a little. After a break for lunch, it was time for serious business. On this day it was raining at the ranch, making the off-road course carved into clay earth particularly difficult. The Rubicon models used for this session were fitted with 33-inch Wildpeak Falken tires. The Gladiator maintains the same approach angle of 44 degrees as the Wrangler so that it can attack steep slopes worry-free. The longer wheelbase reduces the angle at the rear, but Jeep offers protective rails under the Rubicon that do the job well. The only truck that can challenge the Gladiator in off-road mode is the Toyota Tacoma TRD Pro - but only for a while. And that’s because the Gladiator becomes unbeatable when conditions really go south. 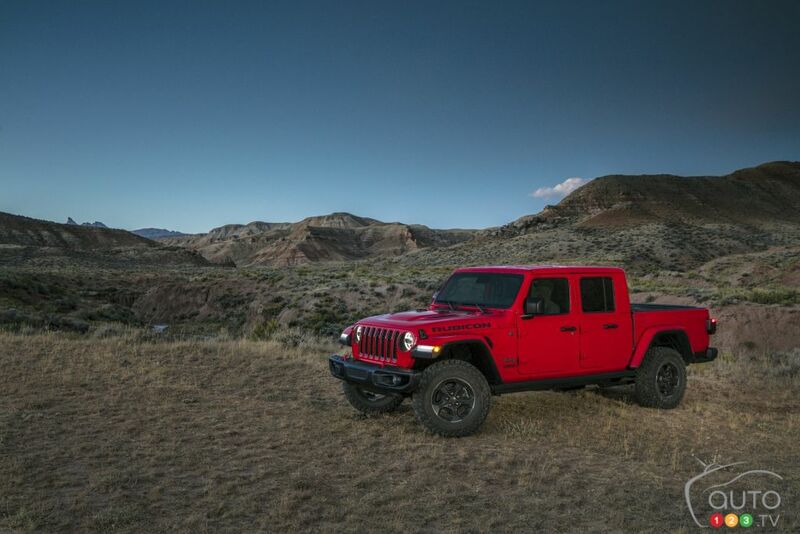 Like in the Wrangler, you have a two-speed transfer case, locking front and rear differentials, a detachable front stabilizer bar and a very low gear that allows the vehicle to crawl at low speeds without driver intervention. Off-Road+ mode adjusts throttle, transmission and stability control for different situations. In the 4 HI mode, the parameters are changed for higher speed performance, for example when passing through sand or mud. In 4WD low mode, it works in the opposite direction, adjusting everything to help cross the more technical obstacles at lower speeds. While the Wrangler is rated to tow up to 3,500 lb, the Gladiator doubles that for a maximum of 7,650 lb (7,000 for the Rubicon), and it can handle a payload of 1,600 lb (726 kg). This is better than any other vehicle in the segment. Estimated fuel consumption figures are 13.7L/100 km in city and 10.7L on highway for the automatic-transmission model and 14.3L/100 km in city and 10.4L on highway with the 6-speed manual gearbox. The Gladiator is more expensive than its competitors, but it offers better towing capacity and off-road capabilities that will make its rivals green with envy. This is the best mid-size truck you can buy, period.